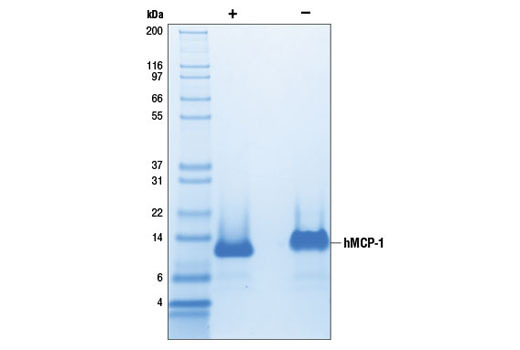 The purity of recombinant hMCP-1 was determined by SDS-PAGE of 6 µg reduced (+) and nonreduced (-) recombinant hMCP-1 and staining overnight with Coomassie Blue. hMCP-1-induced migration of THP-1 cells was assessed. THP-1 cells were incubated in a 96-well transwell plate with increasing concentrations of hMCP-1 in the bottom chamber. After 2 hr, the number of THP-1 cells that migrated to the bottom chamber of the transwell was quantified by measuring DNA content using a fluorescent dye. Recombinant Human MCP-1 (hMCP-1) Gln24-Thr99 (Accession #NP_002973) was expressed in E.coli at Cell Signaling Technology. >95% as determined by SDS-PAGE of 6 μg reduced (+) and nonreduced (-) recombinant hMCP-1. All lots are greater than 95% pure. Molecular Characterization: Recombinant hMCP-1 has a calculated MW of 8,685. DTT-reduced protein migrates as a 10 kDa polypeptide. The nonreduced protein migrates at 12 kDa. The expected amino-terminal QPDAI of recombinant hMCP-1 was verified by amino acid sequencing. The activity of hMCP-1 was determined using a THP-1 cell migration assay. The ED50 of each lot is between 1-11 ng/ml. Less than 0.01 ng endotoxin/1 μg hMCP-1. With carrier: Lyophilized from a 0.22 μm filtered solution of hMCP-1 in 20 mM Tris, pH 7.2 containing 20 μg BSA per 1 μg hMCP-1. Carrier free: Lyophilized from a 0.22 μm filtered solution of hMCP-1 in 20 mM Tris, pH 7.2. Stable in lyophilized state at 4°C for 1 year after receipt. Sterile stock solutions reconstituted with carrier protein are stable at 4°C for 2 months and at -20°C for 6 months. Avoid repeated freeze-thaw cycles. Maintain sterility. Storage at -20°C should be in a manual defrost freezer. MCP-1 (CCL2) is the first member of the C-C family of chemokines to be identified (1). C-C chemokines are characterized by two adjacent cysteine residues within the polypeptide, which form an intra-molecular disulfide bond. 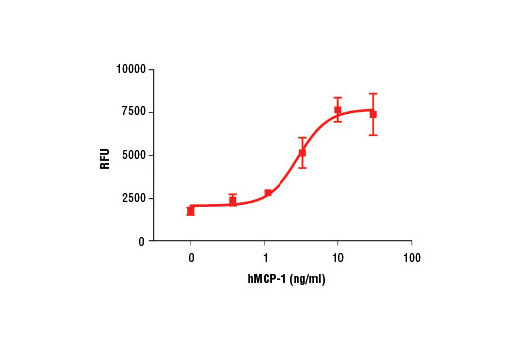 MCP-1 is a potent chemotactic factor for monocytes/macrophages, T cells and a subset of NK cells (1-4). The MCP-1 receptor, CCR2, is expressed as two splice isoforms, CCR2A and CCR2B, of which CCR2B is the predominant form (1). MCP-1 is secreted by adipocytes and appears to be one of many links between obesity, inflammation, and diabetes (1). MCP-1/CCR2 signaling appears to play a key role in γδ effector T cells recruitment and anti-tumor responses in a murine B16 melanoma model (2). Conversely, CCL2 expression is upregulated in many types of cancer and has been implicated in promoting tumor cell survival, proliferation, and tumor associated inflammation (4). Panee, J. (2012) Cytokine 60, 1-12. Lança, T. et al. (2013) J Immunol 190, 6673-80.
van Helden, M.J. et al. (2012) PLoS One 7, e52027. Zhang, J. et al. (2010) Cytokine Growth Factor Rev 21, 41-8.